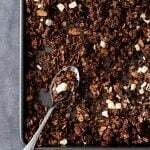 The easiest and tastiest Chocolate Granola you have ever tried! This delicious breakfast or snack requires only 6 ingredients and 10 minutes of prep time. 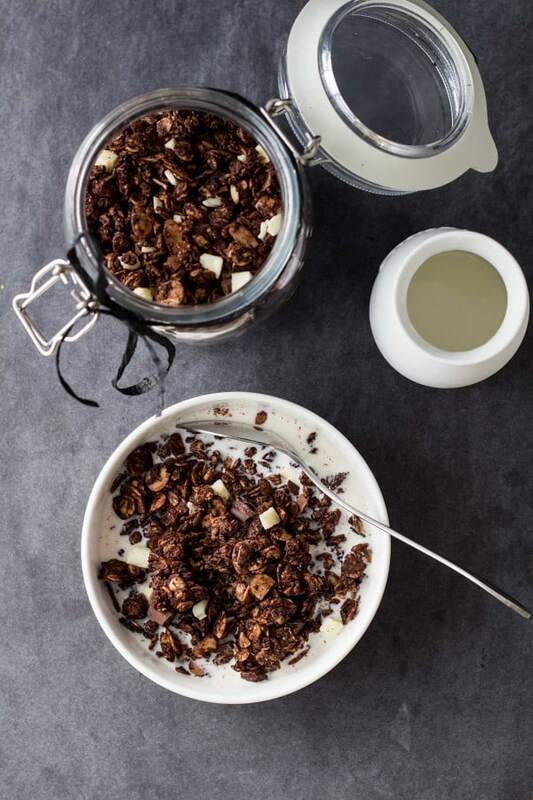 This Chocolate Granola is naturally sweetened with maple syrup. The overall sugar content, however, varies a lot depending on the type of chocolate you choose to add at the end. 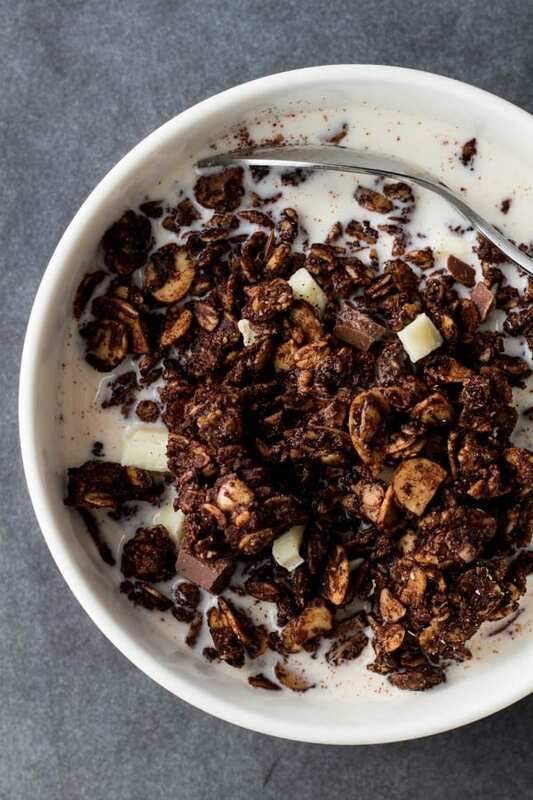 The darker the chocolate, the less sugar, and the less sugar, the healthier the granola. I love mixing dark chocolate and white chocolate. You achieve the lowest sugar content with unsweetened dark chocolate. If you are concerned about your fat intake and/or calories you can reduce the amount of butter all the way down to 1/3 of a cup. I do not recommend using any less than 1/3 of a cup. Granola needs a mix of butter and sweetener to stick together and form the clusters we all love in granola. To make chocolate granola you have to bring cacao powder into the equation and increase the sticky liquid ratio to account for the extra dry ingredient. I like adding dutch-processed cacao as it’s less bitter. On top, I love adding chunks of chocolate once the granola cooled down to give it an additional chocolaty flavor. The best way to store any kind of granola is in an air-tight container at room temperature, preferably in a dry dark place such as a cupboard or pantry. I like using a canning jar with a metal clamp. I feel it keeps my granola the freshest longest. Preheat oven to 300 F (150°C). In a small saucepan melt butter over very low heat. Once barely melted remove from heat and whisk until fully melted. Add maple syrup to butter and whisk until very well combined and smooth in consistency. Add oats, oat flour, sliced almonds, and cacao to a big bowl and stir. Add butter-syrup mix to dry ingredients and combine with a spoon until all dry ingredients are wet. Spread out evenly on a large baking sheet lined with parchment paper (important!) and pop in the oven for 25 minutes. Take out of the oven and stir well, then return into the oven for another 20 minutes. Take out and let cool down completely before touching (minimum 30 mins). 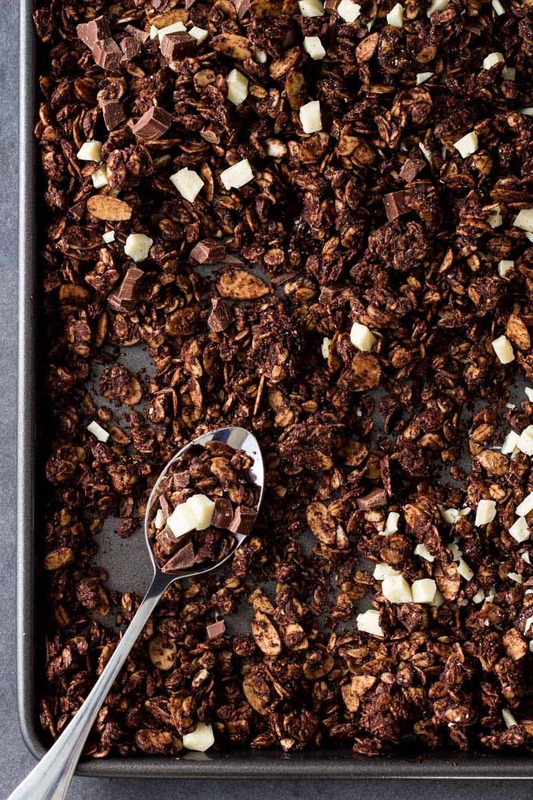 Chop chocolate into chunks and add to granola. Making oat flour is about the easiest thing in the world. Add old fashioned rolled oats to a blender, pulse a couple of times, DONE! Hello all the way from Australia! I love this recipe I just have one question! I really struggle with all dairy… do you have any recommendations as to what I can have this with in the mornings? I don’t enjoy milk or yoghurt and I am always un sure as to what an alternative would be? Hi Dani, I’m happy you like the granola. There are sooooo many plant milks out there. Have you ever tried any of them? Coconut milk, almond milk, rice milk, oat milk. You can either buy them ready made or make them yourself at home, it’s super easy. Basically, all plant milks are 1 cup (almonds or desiccated coconut, or oats, or rice) to 4 cups water, blend in a high-speed blender for a good 5 minutes, let sit for about an hour, then strain through cheesecloth or a nut milk bag. Other than that you could add the granola to a smoothie bowl for example. Delicious! 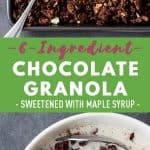 I also love granola and chocolate, so this is just up my alley! Love that it’s sweetened with maple syrup!